That's the view of the City of South Miami, at least, or to be more specific it's the view of three of its five commissioners. By a 3-2 vote, the city commission has, for the second time, passed a resolution calling for Florida to be split into two separate states. The three supporters are apparently concerned that Miami will be underwater before too long and that the northern part of the state doesn't sufficiently care about that. It's surprising that anyone in Florida should be concerned about things like climate change, global warming, or sea-level rise, given that the governor has reportedly advised that it's not happening and banned state employees from ever using such misleading terms. (The governor's office has denied there is any such policy, though if it doesn't exist it's hard to see why this guy was reprimanded for violating it.) But a majority of South Miami commissioners believes that climate change is a "scientific reality" and that projections show sea levels could rise three to six feet by the end of the century. This is a concern, they say, because "[m]any sections of South Florida are 5 feet or less above sea level." North Florida, on the other hand, is on average 120 feet above sea level, and so does not share the same concerns, according to the resolution. 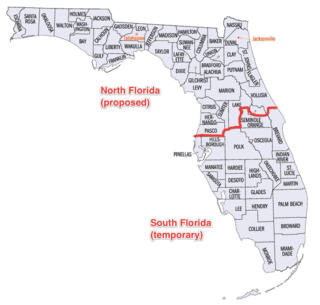 It therefore calls on the Miami-Dade County League of Cities to form a committee to investigate the possibility of making South Florida the 51st state (see map below). The attitude of communities is they do not want to create too much trouble. Let’s not rock the boat. But the boat is sinking. The attitude is also: so we create a state for 150 years. Then the state will be gone. That’s a legitimate argument, that in 150 years, South Florida can be completely gone. His use of the word "legitimate" is unclear—he could be agreeing that yes, South Florida could vanish, which is the whole point of the resolution; or expressing disbelief that someone would actually argue that it's not worth the trouble because the new state will be sleeping with the fishes no matter what we do. I prefer the latter interpretation. For those who might not care too much about losing Miami, Tampa, and/or all points inbetween, the resolution also points out that the two nuclear reactors at Turkey Point south of Miami are less than five feet above sea level, and have more than 2.5 million pounds of nuclear waste buried nearby. Hopefully it's not just sitting out in the yard where it could float away, but still, that's a lot of unpleasant stuff. The resolution does not go any further than calling for the cities to study the problem, so it is not like anyone is calling for the southern part of Florida to secede (except, maybe, the northern part of Florida). To get this done, if they really wanted to do it, would require approval from the state legislature and the U.S. Congress. U.S. Const. art. IV, § 3; see also Kentucky, Maine, Tennessee, and West Virginia. But it could theoretically be done, and would be legal and everything. It remains ill-advised (and ineffective), however, for individuals to try this on a personal basis. See, e.g., "Florida Couple Secedes," Lowering the Bar (Oct. 15, 2008) (noting that state and federal tax officials had declined to recognize the newly declared Republic of Joel and Donna Brinkle).